At Wheaton, students follow their interests and pursue their passion. You can explore more than 100 majors and minors within the liberal arts and sciences, plus design your own course of study. And you’ll receive tremendous support for internships, independent and collaborative research projects and many other learning experiences outside of class work. With more than 600 courses, 47 majors and 59 minors you will find plenty of opportunities to discover how the arts and sciences, humanities and social sciences complement each other. There are so many possibilities that it is hard to limit yourself to one; over 20% of Wheaton students are double majors. Our faculty build relationships that inspire and sustain. We believe education is an active pursuit and our faculty share their experiences and expertise at the intersection of theory and practice. The college has more than 130 full-time faculty members and roughly 90 percent hold Ph.D.s or the top degree in their field of expertise. They teach nearly 600 courses leading to over 100 majors and minors and truly reflect the breadth of our academic experience. Students know their professors as teachers, advisors and often as friends. Our Filene Center supports, enables and empowers students to maximize their academic success through a variety of programmatic, career development and advising initiatives. At Wheaton, you will find global courses and campus programs, study abroad options, an international student body, and a connected community with a world of experiences and perspectives. 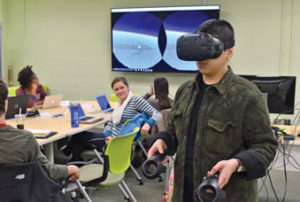 Wheaton has a variety of special projects and initiatives that provide students the ability to put into practice what they learn in the classroom. 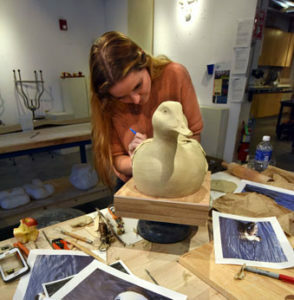 The InterMedia Arts Group Innovation Network (IMAGINE) features 10 physical spaces throughout campus where students, faculty and staff can experiment with art, technology and making. The three newest locations include HATCH, Lab 213 and FiberSpace. Located in Meneely; houses virtual and augmented reality devices, Oculus Rift VR gear and Tobii eye tracking technology, as well as two 85-inch LED monitors. 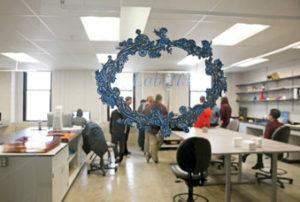 Located in two rooms of the Science Center, known as Wheaton’s central makerspace. It houses a laser cutter and engraver; two 3-D printers; a 3-D scanner; a scanning design computer; and more. The adjacent Machine Shop features additional equipment. 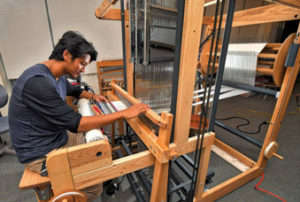 Now located in Watson Fine Arts, this space houses the newest piece of maker equipment—a 30-inch programmable Jacquard loom capable of analog weaving custom textiles from digital inputs.